When we think of a granite countertop, the number once place we imagine this amazing stone is in the kitchen, right? Whether it’s resting below cupboards or occupying space in the center on an island, granite is an ideal choice for those wanting sophistication with long-term durability. As a rich stone that radiates true regalness, a granite counter can transform spaces—whether through vibrant swirls, intricate veining, sharp speckles and even depths of color. Granite offers comfort, practicality and style, yet it’s important to remember the kitchen can’t claim total dominance over this stone. 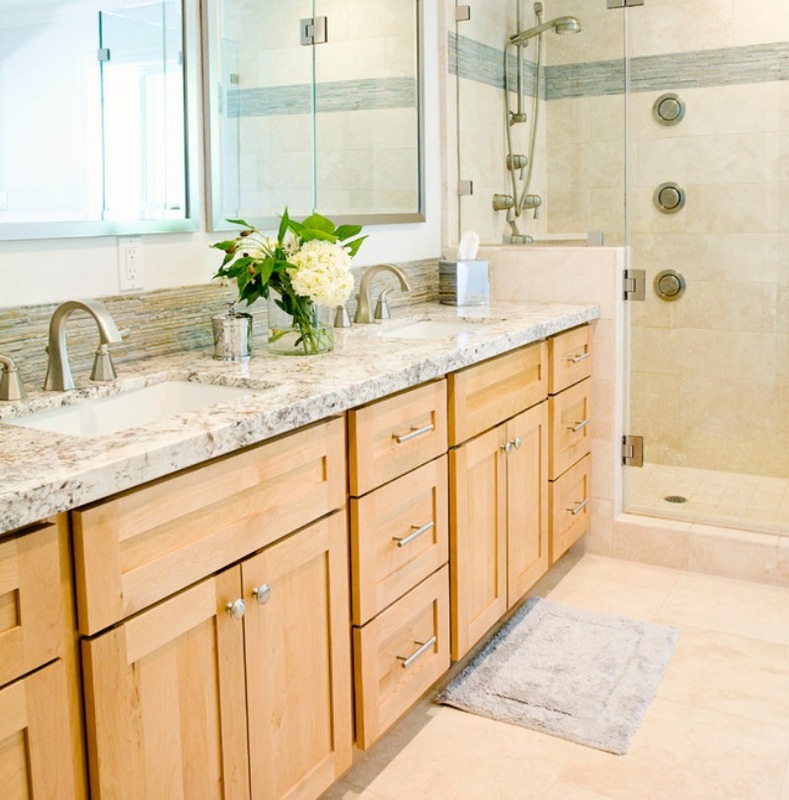 Granite is an ideal decorative choice in a variety of bathrooms, as well. 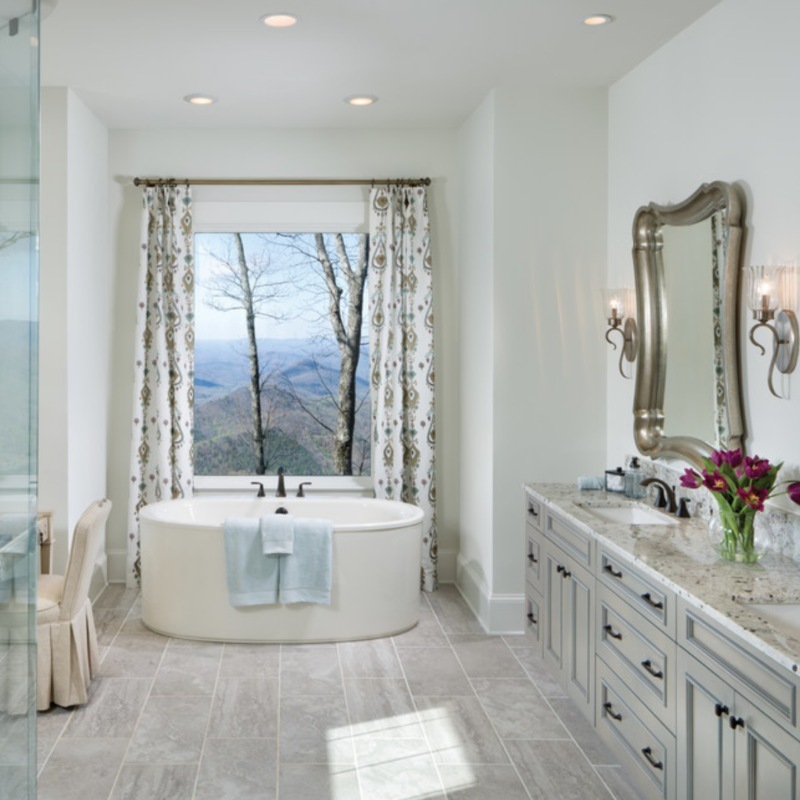 The look and feel of an elegant white bathroom can take your breath away, exuding a timelessness that appeals to a variety of artistic sensibilities and aesthetics. Since granite is known for its durability, cleaning it regularly becomes second nature and a total breeze, especially since it’s resilient when it comes to moisture. In an all-white bathroom, where imperfections can stick out like a sore thumb, granite is resistant to scratching and chipping, proving to really stand the test of time. 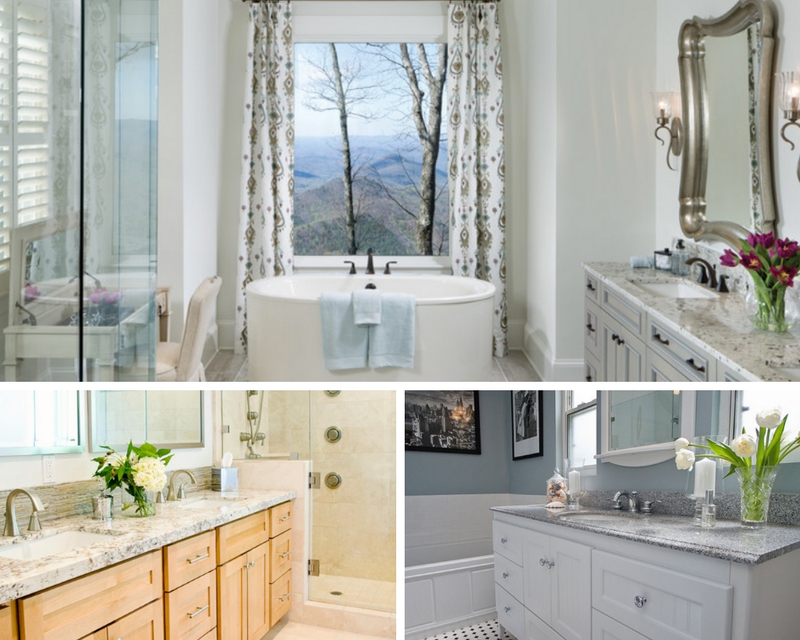 With so many options at our fingertips when it comes to granite, let’s delve into some countertop possibilities to give you some inspiration on how to incorporate it into your white bathroom, where you can embrace style as well as practicality. Alps White Granite is an outstanding choice, ideal for an eye-catching white bathroom, with the ability to appeal to modern preferences, in addition to traditional. The warm white background ornamented with shades of black, white crystals and bordeaux flecks add nuance and variation to any bathroom setting, making it a truly superb granite counter. This decorative and durable stone would even be an outstanding option for accent walls, floors and even backsplashes, offering a soothingly elegant chic charm. River White Granite is known for its subtle gray veining, suitable for a spectrum of layouts. Originally from India, this particular granite features a rich white backdrop speckled with burgundy flecks, as entrancing as it is precise. Naturally, this would be a big favorite for a variety of white bathrooms, particularly below a lit mirror above your bathroom drawers! 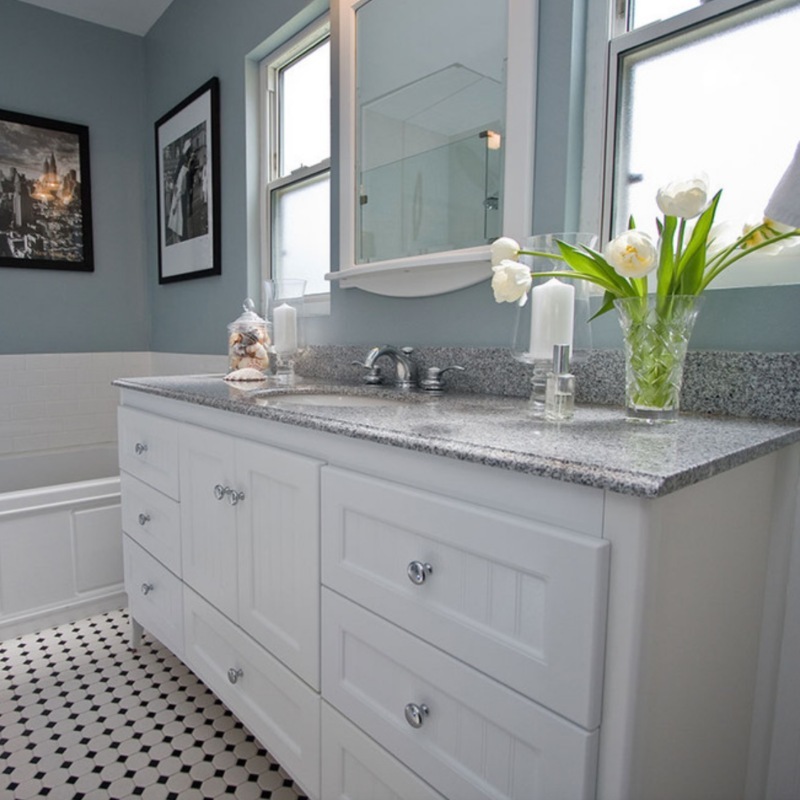 Whether you’re looking to incorporate a hint of color in your white bathroom or a nuanced granite color and design, White Sparkle offers a lot in terms of style and pattern. With White sparkle, most prominently displayed are its cool white tones peppered with different shades of gray; this can match a variety of white and off white décors, adding a nice grounding quality in a room many homeowners might feel inclined to overlook. All in all, deciding to go for a granite countertop to match your all-white bathroom is a smart move if you’re wanting durability without sacrificing style. As you can see, there are a variety of options, specifically when it comes to granite colors and pattern. In your home, your bathroom should be a welcoming refuge, which is why opting for a granite countertop can create a lasting impact where true style meets real durability.